Basseterre, St. Kitts – The Ministry of National Security will host a press conference Friday to address security issues and to update the country on its initiatives and those of the various security agencies. 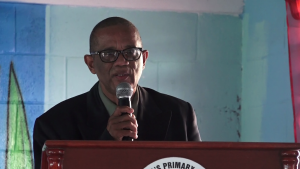 Permanent Secretary in the Ministry of National Security, Osmond Petty explained that there has been an increase in visibility of the security forces. This is being done through frequent stop and search exercises, regular vehicle check points and other ongoing anti-gang actions conducted by police and other security agencies, including the St. Kitts-Nevis Defence Force. He added that despite these efforts, the government and people of St. Kitts and Nevis continue to be concerned with the relatively high homicide rate, as well as other criminal activities that continue to plague the federation. A situation, he said, was compounded when there was an indication that juveniles may be involved in some of these crimes. “Since last year, the Ministry of National Security began to build-out a Social Intervention and Community Policing Programme that focuses on broadening the concept of an anti-gang policy to include engaging young people in our communities, assisting at-risk youth and, generally, vigorously pursuing programmes that potentially can change community norms through youth development,” said Petty. “Intensifying rehabilitation programmes, along with assisting released residents of Her Majesty’s Prison to reintegrate into society and find employment are also priorities. He disclosed that the ministry is also developing a broad-based National Security Strategic Framework with the aim of reviewing the operations and functioning of all agencies within the Ministry of National Security. Petty and National Security Adviser Maj. Gen. (retired) Stewart Saunders will lead the ministry’s presentations at the press conference. Senior officials from all security and law enforcement agencies within the Ministry of National Security will also be present to address questions that may relate to their particular operations. The event will be streamed live on the SKNIS Facebook page at https://www.facebook.com/sknismedia/.